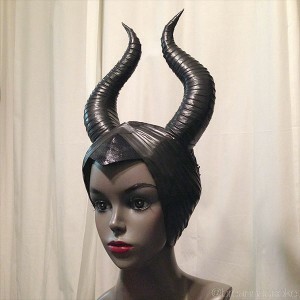 More Maleficent! I had the good fortune of bumping into Alan Tijerina Photography while I was at Dallas Fan Days in February. 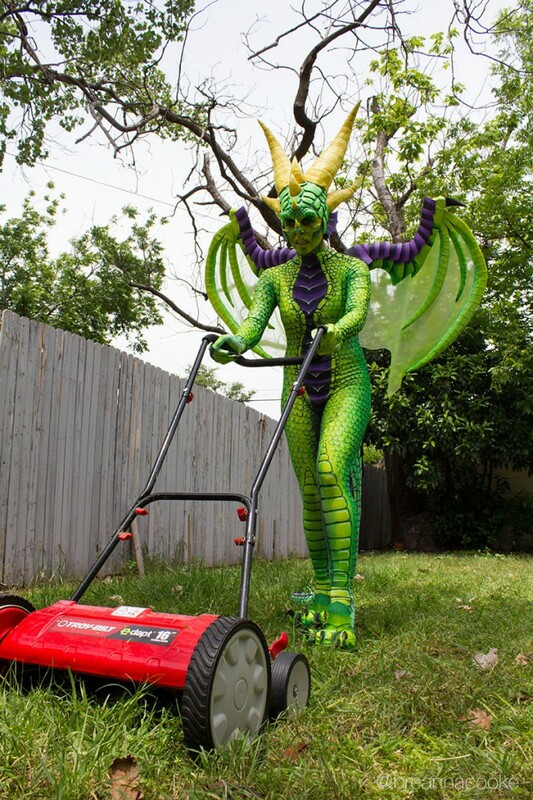 He captured some great photos of my Maleficent costume on the patio at the Irving Convention Center. 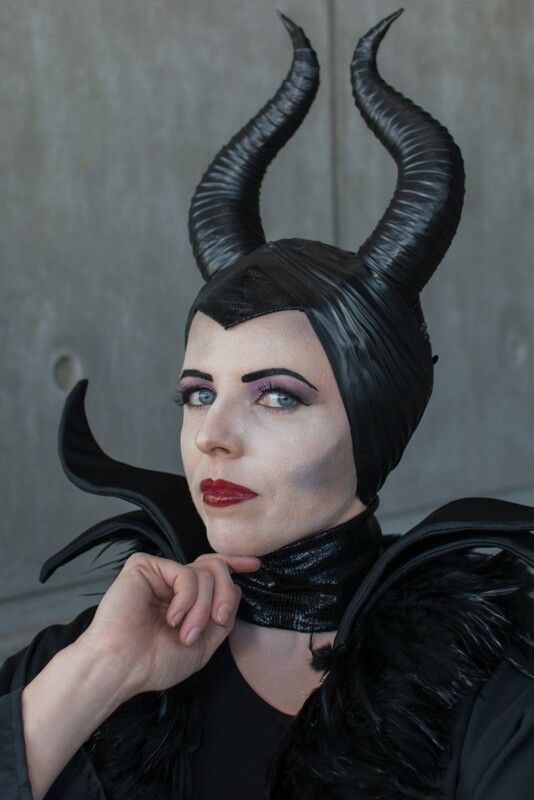 And in case you missed it, take a look at my blog posts about how I made my Maleficent collar and horns so you can be Maleficent too! 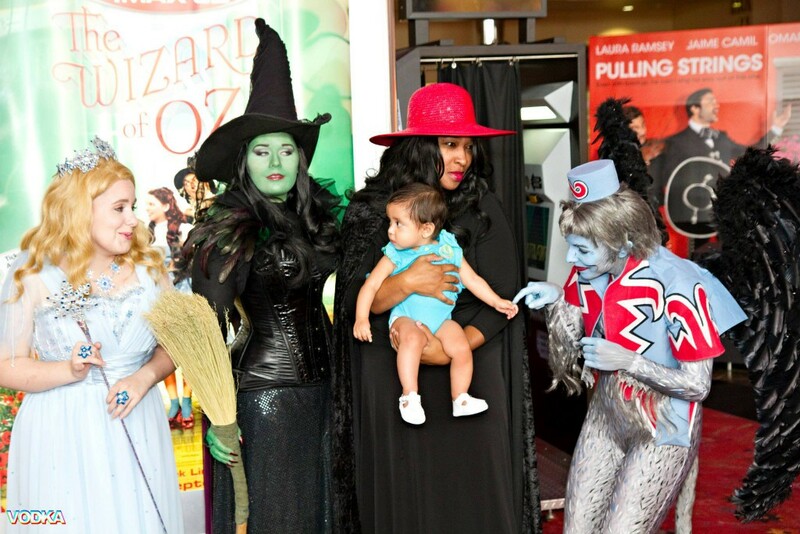 Last Friday I won the Saturday ticket giveaway from the Irving Convention Center for Dallas Comic Con Fan Days! 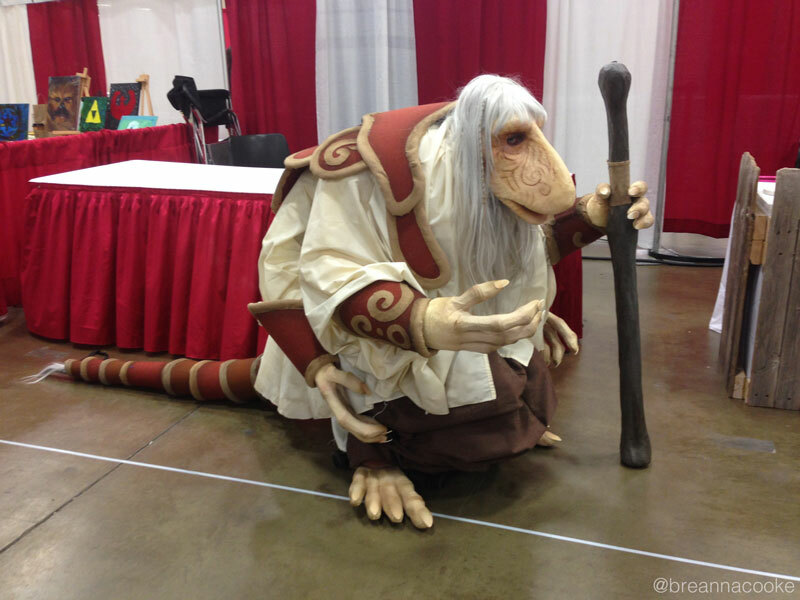 I was so excited, but I didn’t have a new costume finished…and how could I go to Fan Days without dressing up?! 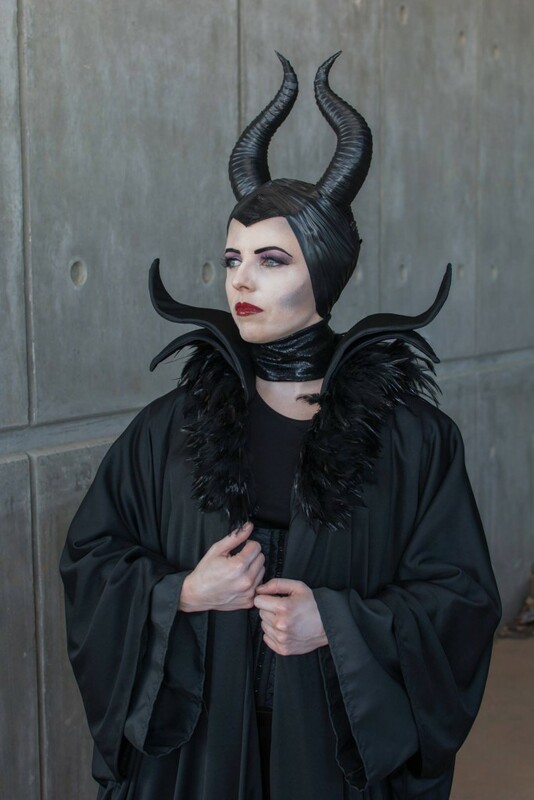 I already had Maleficent horns from a previous project, so I took on the challenge of making a Maleficent collar and cloak in one night. 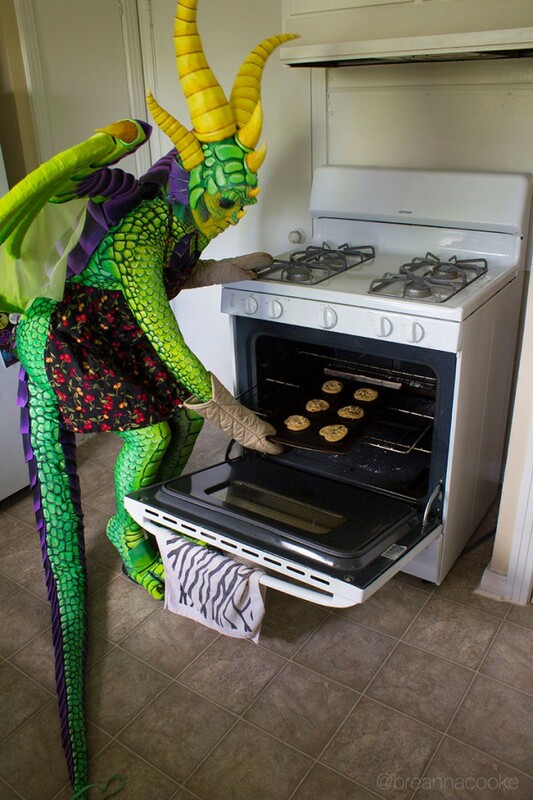 Below are some of my behind-the-scenes photos of my late night crafting. 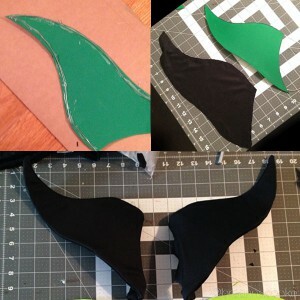 I got some great ideas from this DIY Maleficent tutorial by Pins and Things. She used cardboard and wire to hold the collar upright. I opted for craft foam, hot glue and wire as the core for my collar. I sandwiched the wire between a layer of craft foam. Then I sewed fabric sleeves for each section, pulled it over the craft foam, and sewed up the open end. The robe for my costume wasn’t going to support the weight of the collar, so I made a base from EVA foam (you can use those interlocking anti-fatigue floor mats, visit my Resources page for where to buy it). Now the whole collar would be a solid, removable piece from the robe. 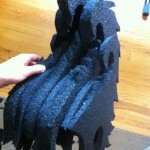 I shaped the EVA foam with a heat gun and made a fabric sleeve for it in the same way I made the collar sleeves. I hot glued and sewed the individual collar pieces to this foam/fabric base, then loosely stitched it to the robe. 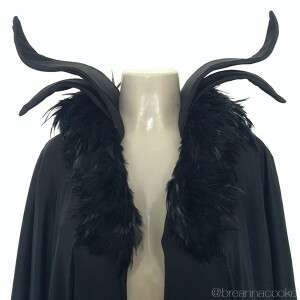 In the recent Maleficent movie, she has a cloak with the iconic pointy collar and a cloak with a feather collar. I took the best of both and added the feathers to mine. I used a section of black hackle feather trim (check Michael’s or Hobby Lobby) and glued it to the collar base with hot glue. I never thought I’d find a use for my graduation gown, but tada! 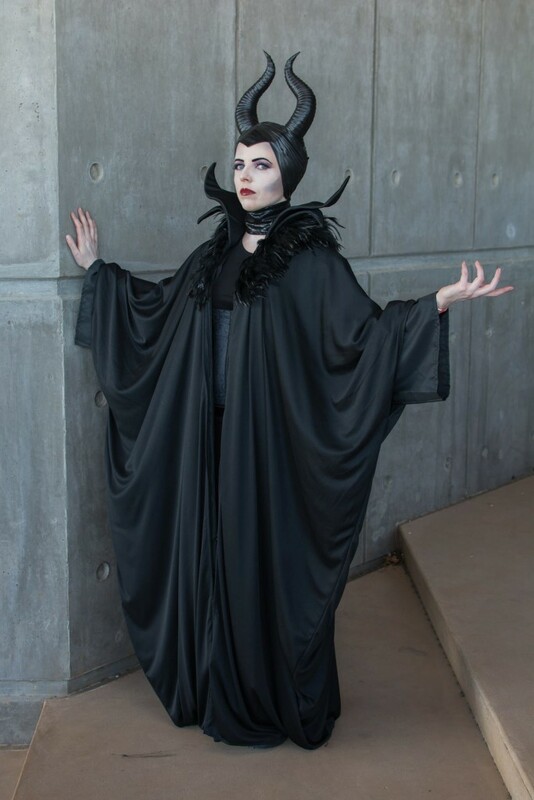 It provided a great base for the Maleficent robe. 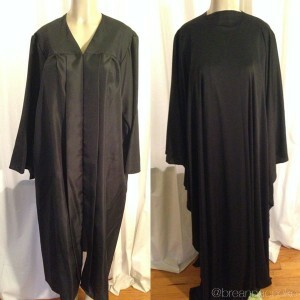 I purchased 4 yards of black polyester, cut a hole in the middle, and draped it over the robe like a poncho. I sewed the sides of the fabric “poncho” and left room for armholes, then cut open the front and stitched the fabric to the collar of the gown. 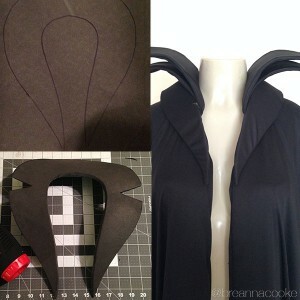 If I’d had more time, I would have loved to make a really elegant cloak from scratch. Maybe next time! And don’t forget the horns! 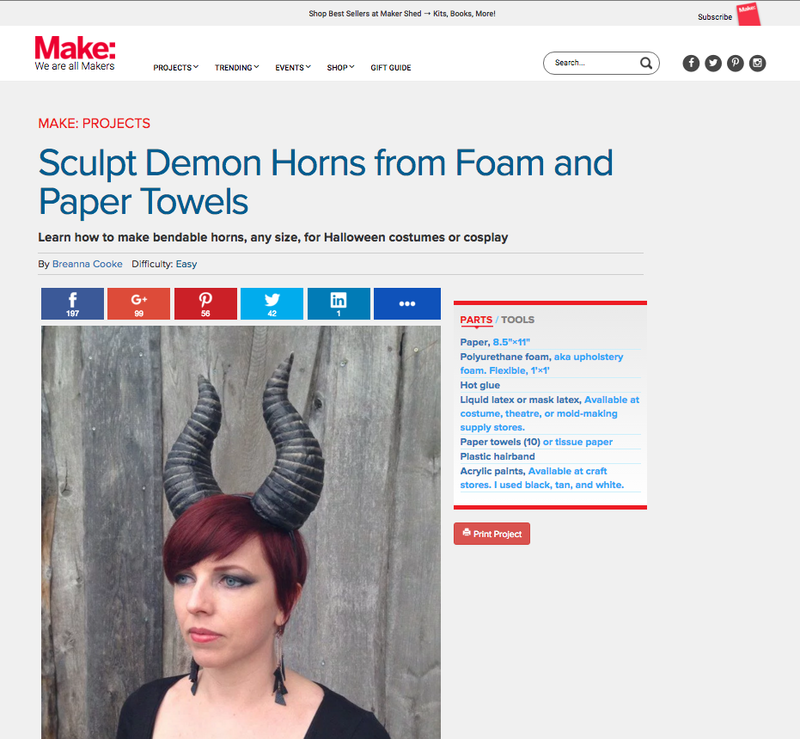 Check out my other post with details about how I made my Maleficent horns. 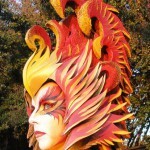 They’re made with reticulated foam, craft foam and electrical tape! 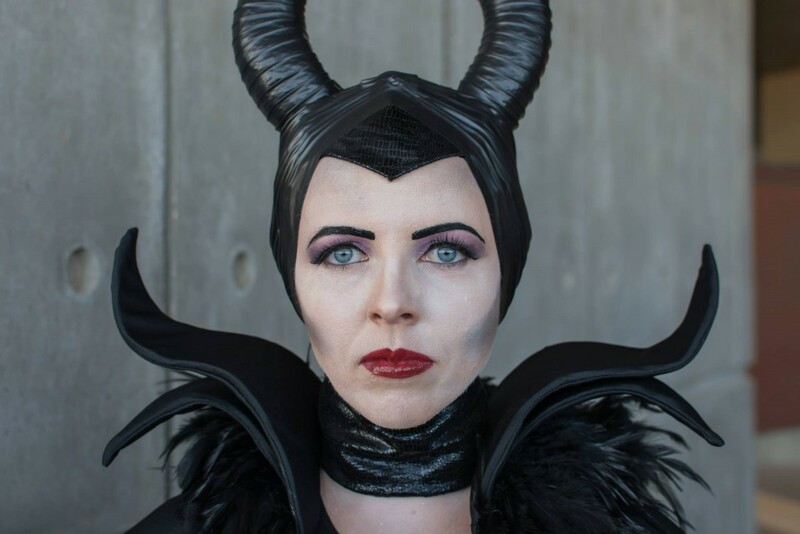 I used a variety of products to create the Maleficent face. 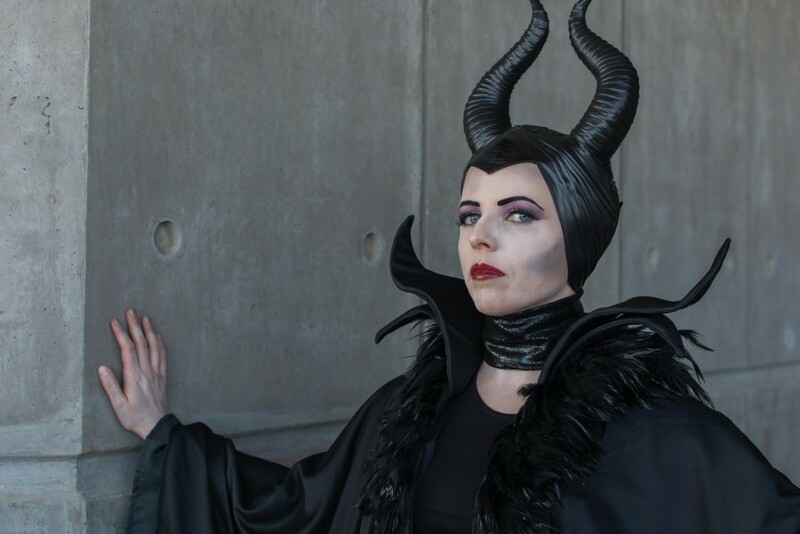 I love the purple accents in the cartoon version of Maleficent, so my makeup was a mashup of both Maleficent looks. 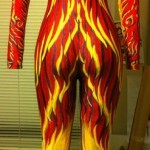 Face: Airbrushed with European Body Art Endura airbrush paint in white and black. Contours with grey eye shadow. 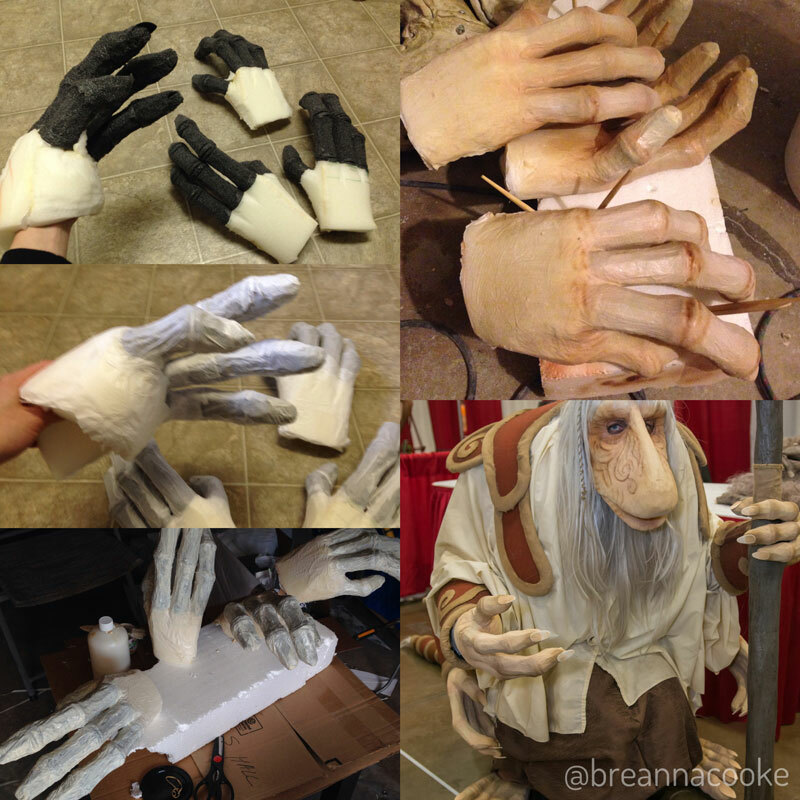 Read my Flying Monkey Costume blog post to see more behind-the-scenes photos for my monkey costume. 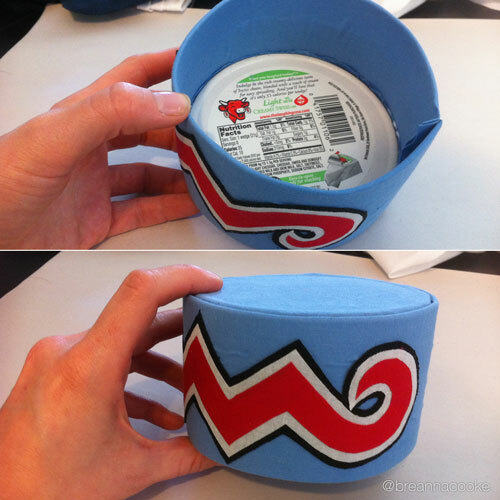 The hat is made from a Laughing Cow Cheese container, craft foam, and cotton fabric. Unfortunately I didn’t document it well while I was working on it. 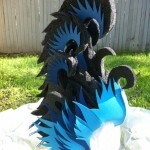 The side of the hat is craft foam covered in fabric. 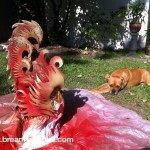 I used spray glue (Super 77) to glue the fabric to the craft foam. I drew the zigzag design on paper, then traced it on the red, white, and black fabric, and made each one slightly larger than the last. 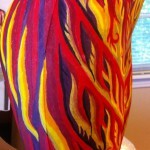 The zigzag pieces of fabric were also glued with spray glue. I also added a chin strap with thin elastic, like the elastic on party hats. 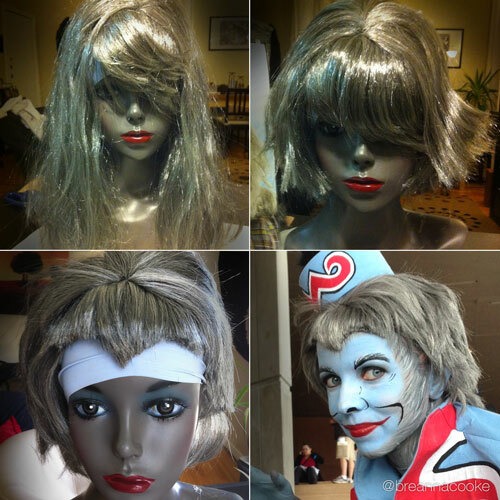 The wig started out as a weird Moses/Zeus wig from Party City. 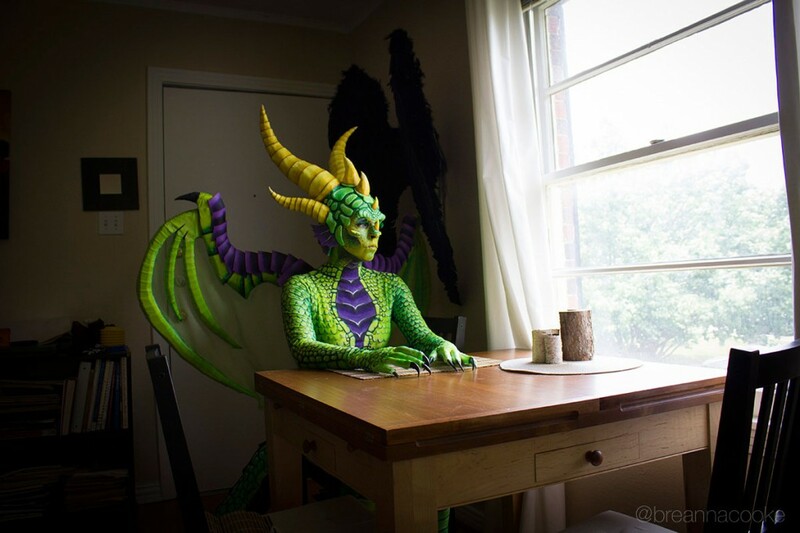 I didn’t have enough time to order anything online, so I used what I could buy locally. 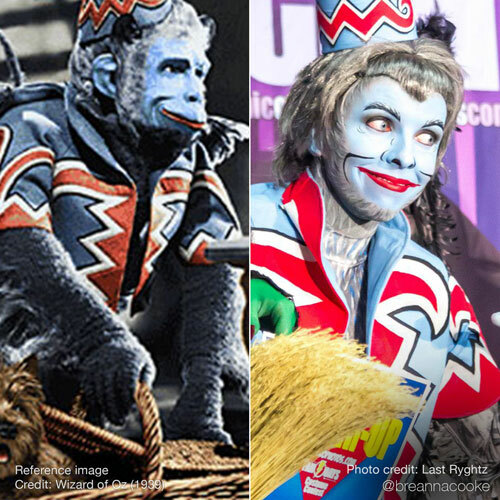 Armed with scissors, I slowly cut away at it to give it the signature widow’s peak of the monkeys (and most simians) in the 1939 edition of Wizard of Oz. I had my doubts at first but I’m really pleased with how it turned out. I created a paper pattern for the jacket based on reference photos and an existing fleece vest I own. 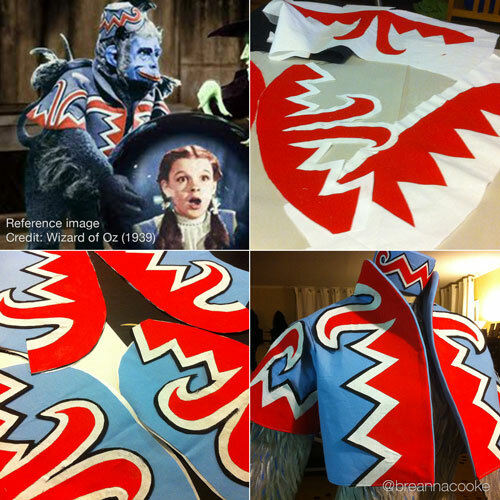 Using plain cotton fabric in light blue, red, white, and black, I cut out all the layers to create the zigzag pattern and jacket base. I glued the zigzag layers together with spray glue (Super 77), attached it to the blue part of the jacket, and added interfacing to give the whole jacket the structured shape. 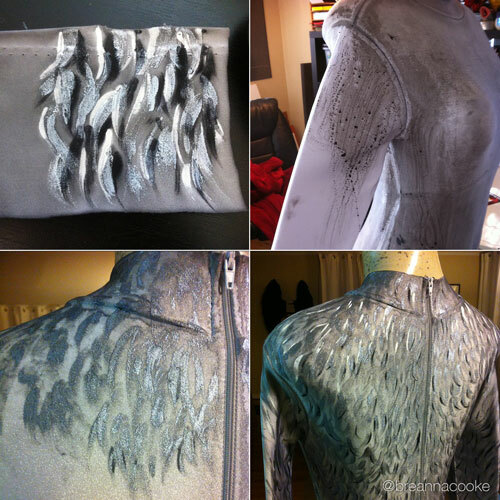 I also added slits in the back of the jacket (not shown) for my wings to poke out. Cotton Fabric: Light blue, red, white, black – measure the amount you need based on your paper patterns and don’t forget about the hat! 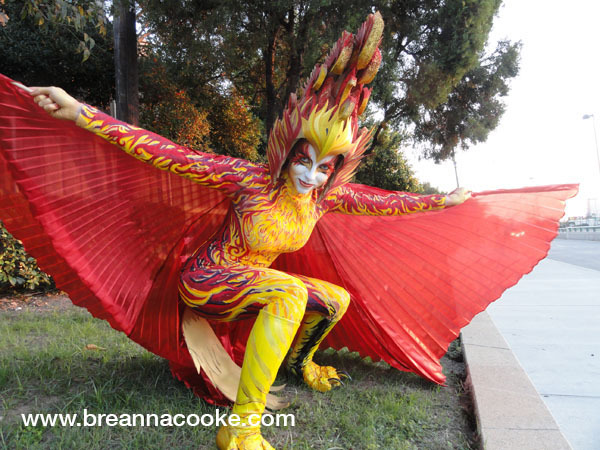 This costume, like my dragon costume, features a hand-dyed and painted bodysuit. I first tested the dye on a scrap of Lycra (1st image). I used Jacquard’s Dye-na-flow black, watered it down, added a few drops of Jacquard’s AirFix, and brushed the dye onto the bodysuit. 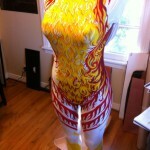 Once it was dry, I painted on the fur with Jacquard’s Neopaque and Lumiere fabric paints. I wanted to look like I was barefoot without actually being barefoot! 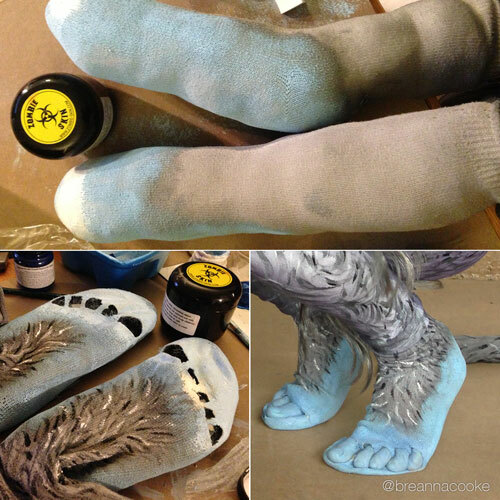 Using some white socks (synthetic fabric), I stuffed them with polyfill, then dyed and painted them with fabric paints (same as used on bodysuit). 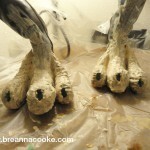 I applied Zombie Skin (a creamy latex) to the toes to reinforce the toe area. 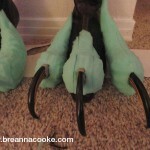 I pulled the stuffing out of the socks, added some foam insoles, then cut out holes for each my toes. 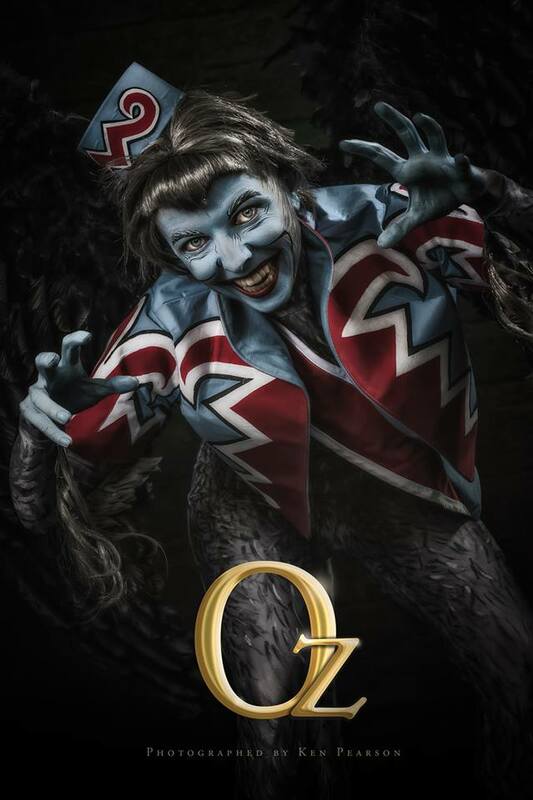 When I wear the costume, I paint my toes with same blue bodypaint I use for the face (see #7). 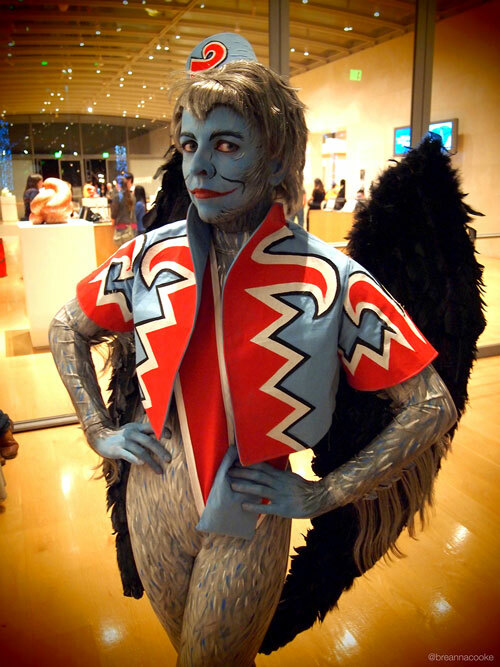 I made these wings a few years ago for my Harpy costume but they worked well for my monkey costume too. The frame was commissioned from Danielle Hurley and she does amazing work! 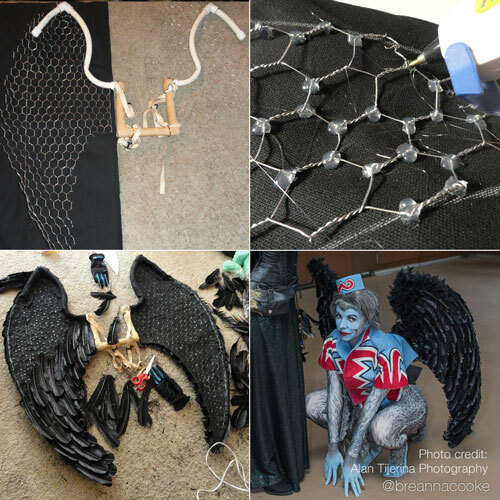 I used chicken wire as the frame for the wings and hot-glued it to black canvas. 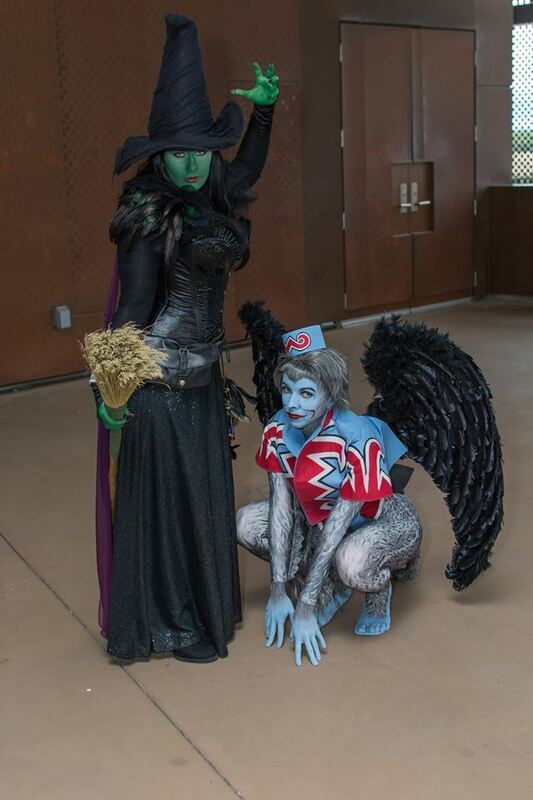 I hot-glued approximately 350 black turkey feathers for the wings and used down from a black feather boa for the top. Needless to say, these wings are a tad heavy but they are definitely sturdy! I followed reference photos from the movie so I could capture the big smirk of the monkeys. 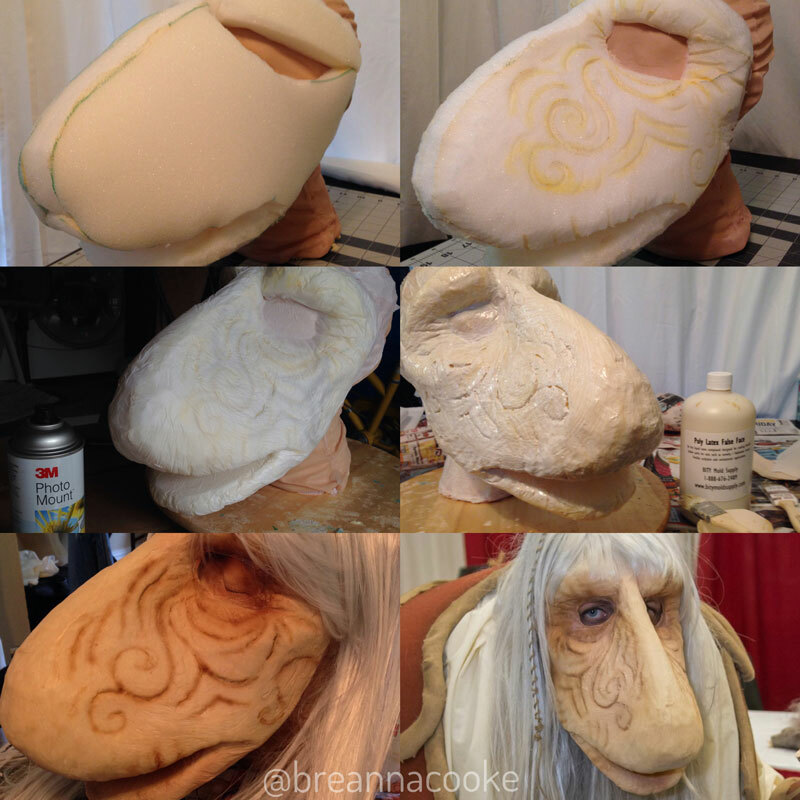 Since I wasn’t using any prosthetics, I also needed to give the illusion of monkey features with makeup. 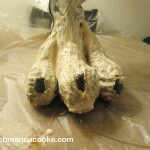 I painted my nostrils black to make them look wider and added accent lines to widen my nose and mouth. 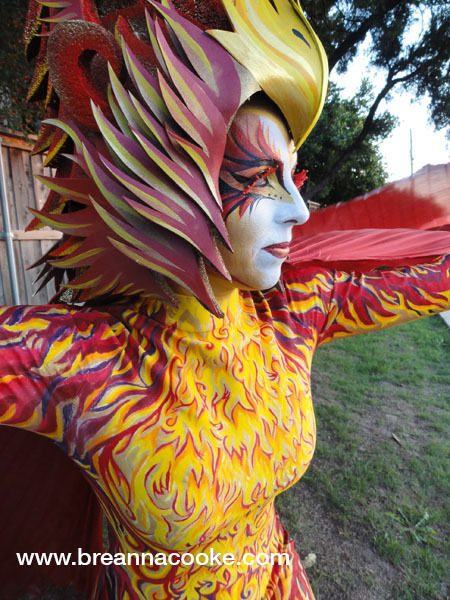 I used professional water-based bodypaint to paint my face, hands, and toes and red lipstick on my lips. 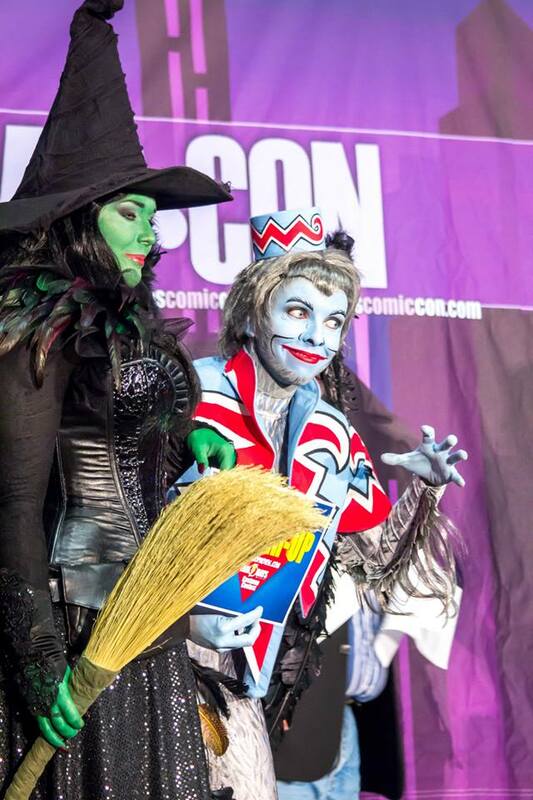 I’ve also been known to hang around with a certain Wicked Witch of the West (Chelphie Cosplay) at various events. 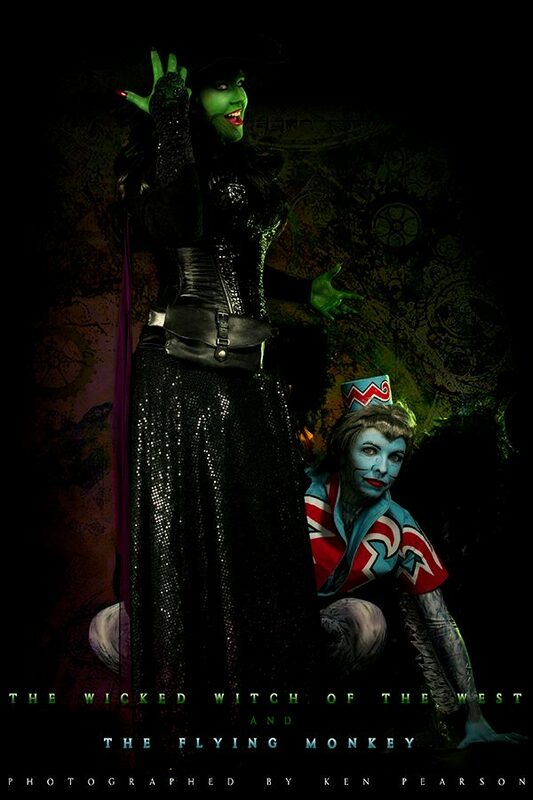 Have a look at photos of our dynamic Oz duo. 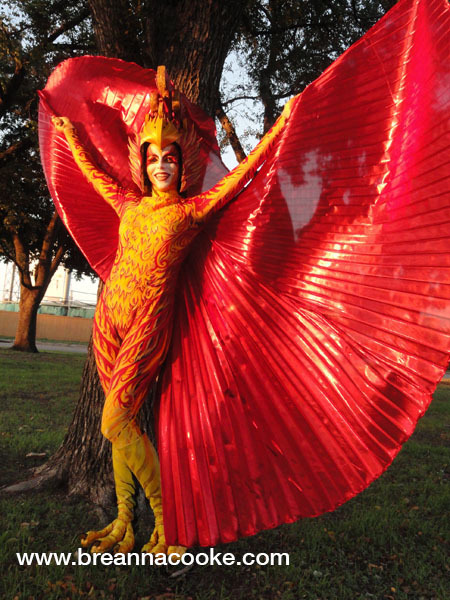 My Halloween costume was a mythological phoenix, the colorful red and gold bird that bursts into flames and is reborn from its own ashes. 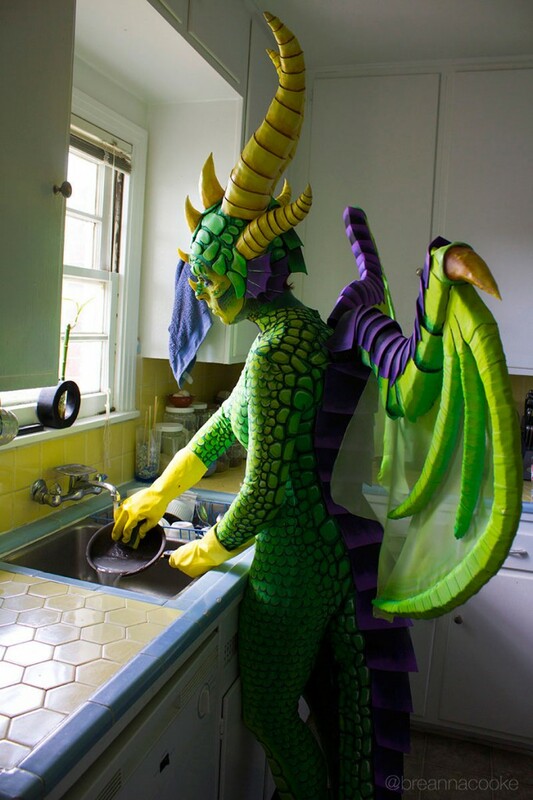 This costume consumed all my free time in September and October, but I’m really pleased with the result! I’ve posted these instructions on Instructables.com too! 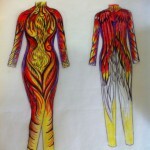 Plan out your design, then start painting! This design took me at least 40 hours to complete. 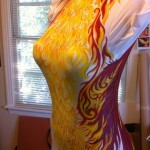 Having a mannequin is crucial for holding the body suit in the stretched position. 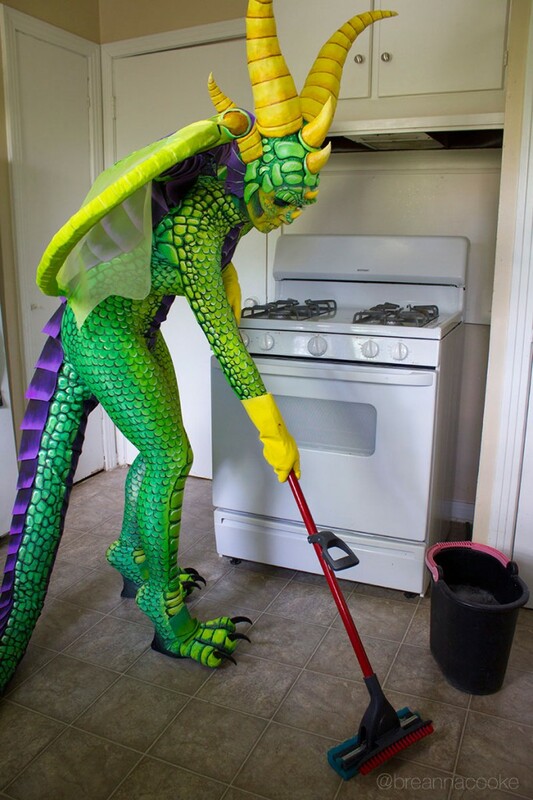 The body suit is made primarily from nylon, so I chose Jaquard paints because they were one of the few that list nylon as a suitable base. 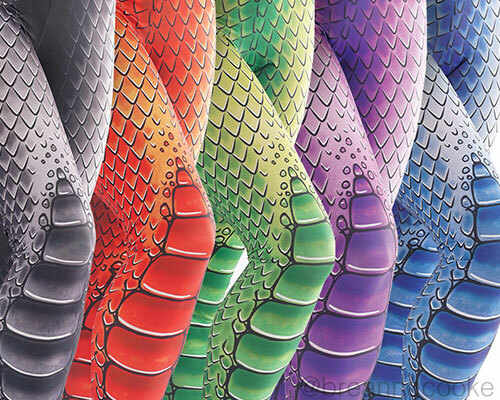 If your body suit is made from a different fabric, you may want to investigate a different brand of paint or do a test sample. 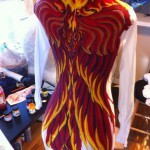 After the body suit is dry, flip it all inside out and iron it with the correct setting for the fabric. 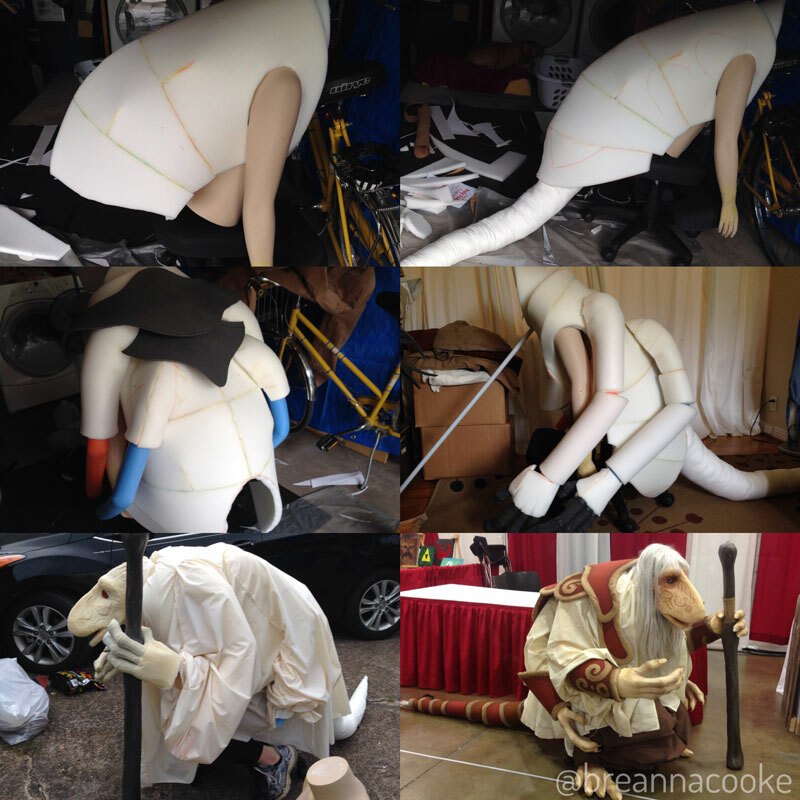 I placed towels in the legs and arms so the designs weren’t pressed together under the heat. 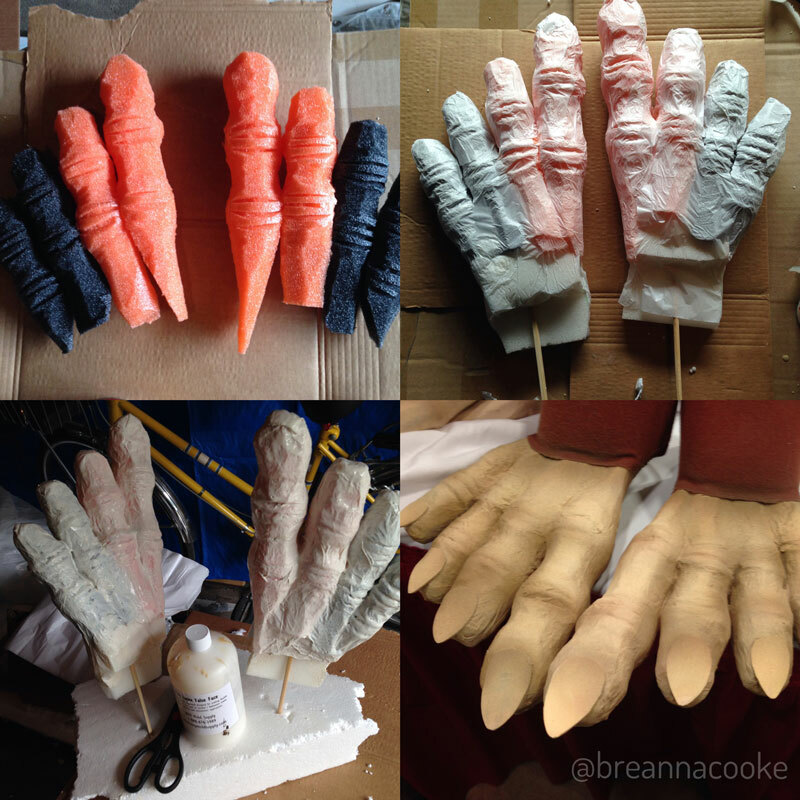 Glueing in fake bear claws. Painted foam to match boots. 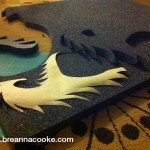 Using craft glue, stick together pieces of foam so that they are wide enough for a toe (about 3 inches wide). 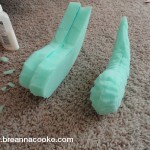 Shape the foam with scissors so that it is rounded and toe-like (repeat 5 more times). Cut out an insert for the claw, but don’t glue the claw in yet. Paint the green foam with acrylic paint so it matches the boots. 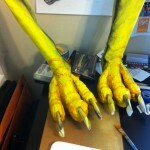 Using the foam brushes, paint the toes and boots with liquid latex. 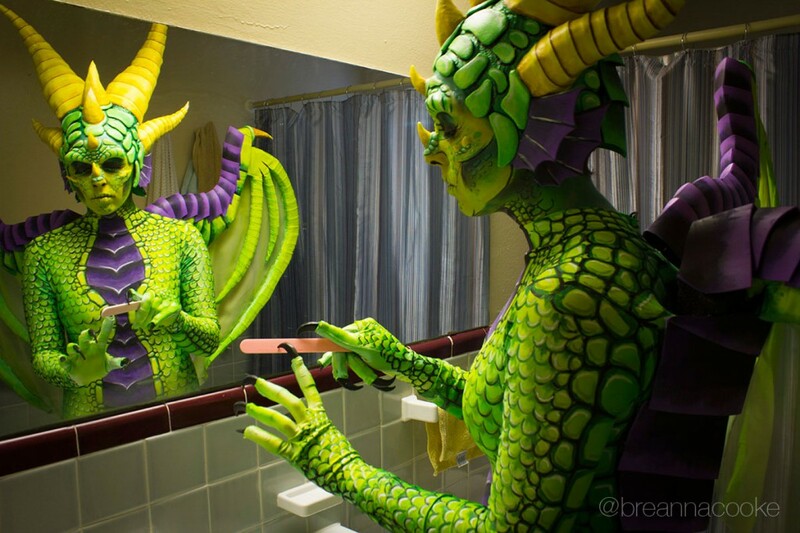 Be sure to follow the instructions on the liquid latex. 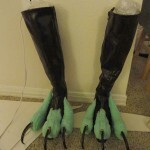 Once the latex is dry, glue in the claws. 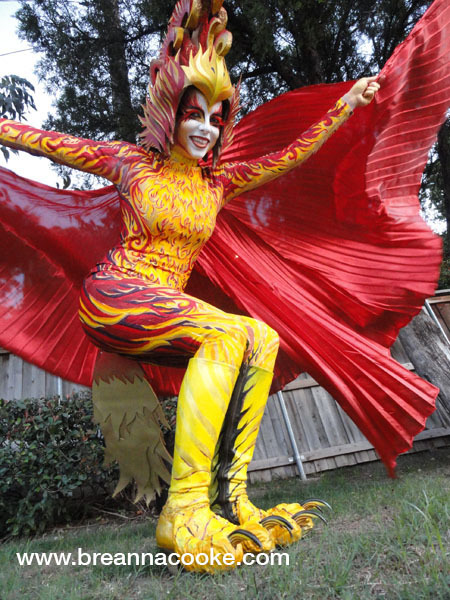 Then paint the boots to match your costume. 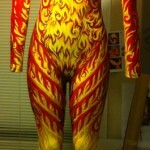 I used fabric paints since they would match the body suit even though they’re not the perfect paint for sticking to latex (and I’m not sure what is). Hand-drawn paper templates traced onto polyethylene foam. 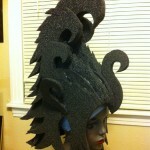 Layers of foam to create head shape. 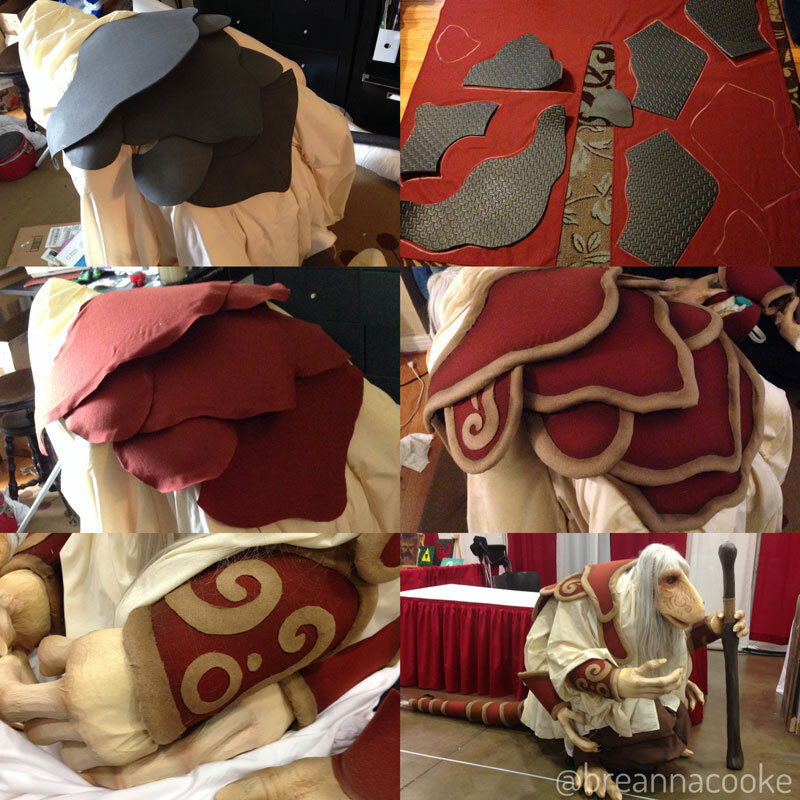 Added pieces of craft foam. 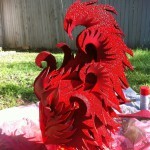 Layer of red spray paint. 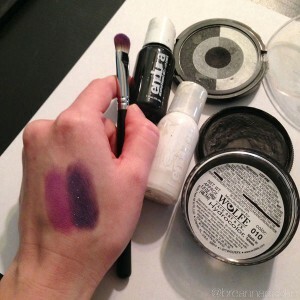 With water-based face/body paints, dip your brush in water and rub it on the surface of the dry cake until the paint is a smooth and creamy consistency. 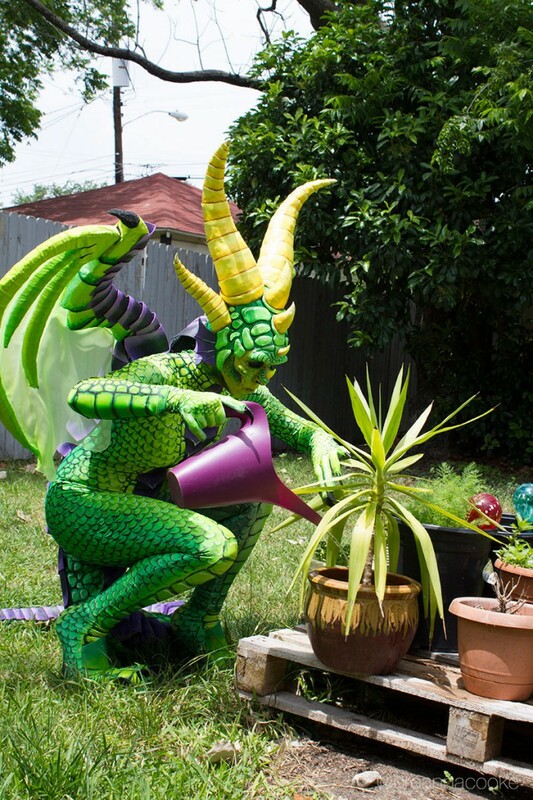 Now paint your face however you wish! I don’t have any process photos of this part, so you get to be creative!